It was a day when the Gods descended in the west to witness the wedding of lord Venkateswara. Used to seeing the wedding at Tirumala, it was a change for them! The venue was Dallas metroplex. 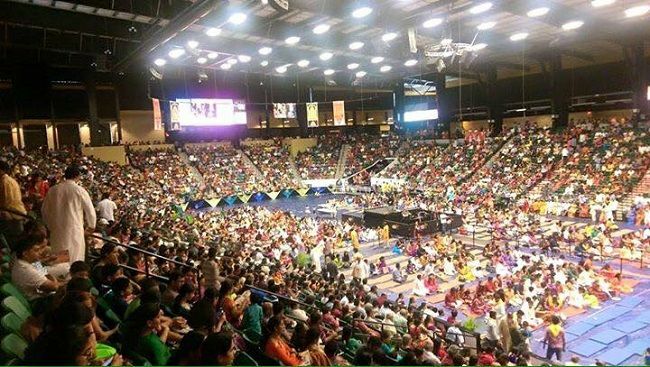 A modest 10,000 devotees thronged at the venue Dr. Pepper Center in Frisco. The divine serenity, and the blissful smile of the Lord opened the doors at 7.00 AM. A unique and an once-in-a-lifetime experience was in the offing as there were four major events happening. Suprabhata Seva, Vasanthotsavam, Archana and Kalyanam. Seldom get devotees a chance to watch such events back-to-back at Tirumala. But the Lord who is always a giver didn't let this opportunity go amiss for the welfare of the devotees. The volunteers had worked round the clock for the last 30 days for this event. The Suprabhata Seva started at 8.00 AM with the Tirumala Tirupathi Devasthanams JEO Pola Bhaskar I.A.S, TTD Board member A.V. Ramana, Chief Vigilance and security officer Nagendra Kumar flag shipping the event. The archakas hymned the Suprabhatam invoking the Lord. The curtains were open and the devotees witnessed an eternal bliss at the sight of the Goddesses and the God. Later Vasanthotsavam and Archana were performed for the deities and the holy Tulasi water was sprinkled to the visiting devotees. Upon arrival of the TTD Chairman Chadalavada Krishnamurthy the Archakas began the Kalyana Mahotsavam and the whole center was reverberating with chanting of Govinda Nama, Annamayya Keertanas and the musical entourage from TTD. The devotees engrossed themselves in the chanting and a divine fervor was clearly visible. Couples sponsoring Kalyanam were performing with utmost devotion. Elaborate arrangements by over 300 volunteers were made by the organizers such as seating, food, beverages, registration, Kalyanam donors, hospitality, Darsanam, decoration e.t.c. Speaking at the occasion TTD Chairman thanked the devotees and felt happy for organizing Kalyanam in Dallas. Dallas metroplex Mayor Maher Maso read the proclamation at the event as July 12th 2015 will be henceforth called 'Srinivas Kalyanam Day'. Other dignitaries JEO Pola Bhaskar I.A.S, TTD Board member A.V. Ramana, event organizer Gopal Ponangi addressed the crowd explained the importance behind Srinivasa Kalyana Mahotsavam and the welfare for the mankind behind such events. The core committee members who worked round the clock to make the event memorable were Satyanarayana Pulipaka, Gopal Ponangi, Ravi Akula, Vijay Todupunoori, R.K. Panditi, Srinivas Kongara, Shyama Rumalla, Venkat Narpala, Rao Kalvala, Mahesh Adibhatla, KC Chekuri, Ranga Rao, Srinivas Pamidimukkala, Sreekanth Konda, Mahesh Choppa, Kiran Chelamalla, Uma Mahesh, Madan Bijili, Chandra K. Bandar, Ravi Pattisam among others. Leaders such as Aravinda Rao Ex. DGP, Prasad Thotakura, Dr. Sridhar Reddy Korsapati, Dr. Raghavendra Prasad, Prakashrao Velagapudi, TANA Executive VP Satish Vemana among others were witnessing and participating the event.